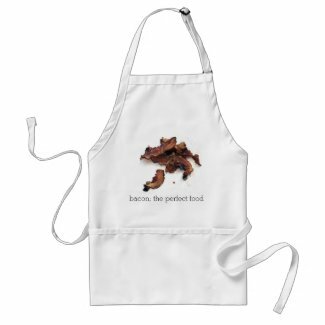 Candied bacon…I’m all shook up! Over dinner one night many years ago, a friend made an out of the blue declaration that “bacon was the perfect food!” Naturally we all laughed and have continued to joke about the perfect food ever since. But the more I think about it the more I think this friend of ours may have been onto something. What would Quiche Lorraine be without bacon? And how sad would that BLT sandwich be without good ol’ bacon? Not to mention my roasted brussels sprouts or mashed turnips. Yes, in-fact I’m beginning to think that bacon may be just a bit more important (and versatile) than it’s been given credit for. I recently started planning my Easter dinner menu (yes, I do realize it’s still four weeks away!) So perhaps it was just a coincidence or maybe it was predestined, but while flipping through cook books the other day I stumble upon a recipe for Candied Bacon Brownies. “Candied bacon brownies…” I thought to myself “…that’s a crazy good idea! But way too decadent, too rich and too over the top to actually bother to make.” And so I moved on. Then a few days later the Today section of the paper had a recipe for an escarole salad topped with candied bacon. Seriously, what are the chances of candied bacon popping up in my life twice in a matter of days? I took it as a sign. I immediately liked the idea of using candied bacon as a garnish, it would allow you to enjoy the salty/sweet aspects of the bacon but not be overwhelmed by it. 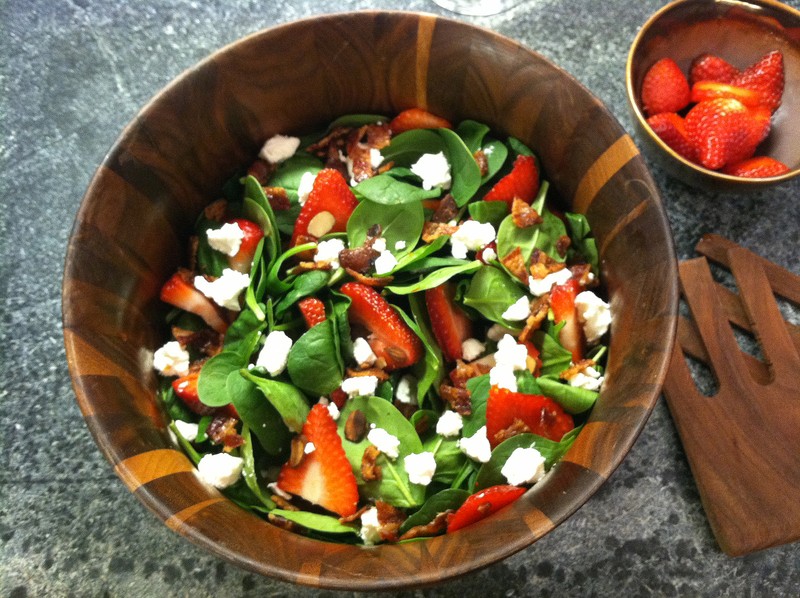 Since I had already planned to serve my spinach salad with sliced strawberries and goat cheese on Easter, sprinkling a little candied bacon on top seemed like a no-brainer! Now to come up with a more decadent use… I imagined that a combination of chocolate and candied bacon might literally cause some folks to swoon. But I also thought that it would be so rich that any more than a single bite would be too much. So I decided that instead of brownies or even cookies I would make… fudge. Yup, Candied Bacon Fudge. Sounds like something Elvis would have eaten doesn’t it? 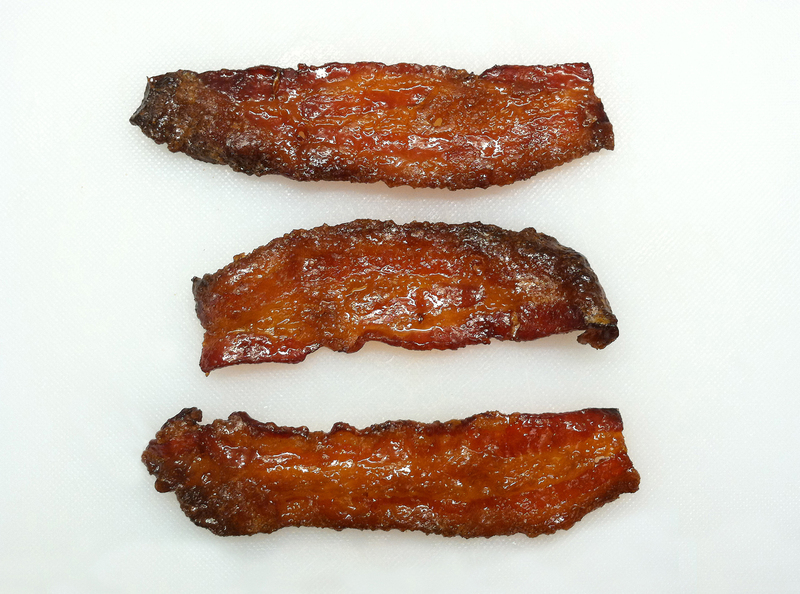 Okay, so let me tell you what I’ve discovered about candied bacon… It’s pretty damn delicious! It was a great addition to my spinach salad (actually I can’t believe I ever thought the salad was good without it!) and it turned already delicious fudge into something a bit more special. Candied bacon doesn’t belong everywhere, but it definitely has its place in my cooking repertoire. I know this sounds like a crazy idea but it really is delicious, and surprisingly versatile. It kicks a plain old BLT up a notch, is great along side a couple of eggs and tastes pretty fantastic eaten all by itself. Preheat oven the 350°F. Line a jelly roll pan with foil and place a cooking rack in the pan, set aside. Put brown sugar in a container with sides (something long enough to allow you to lay a slice of bacon out flat). Add bacon, one slice at a time and dredge in the brown sugar. Put the sugar coated strips of bacon on the rack and repeat until all the slices are done. Sprinkle a little additional sugar over the top of the strips and put into the preheated oven. Bake for 15-25 minutes (depending on thickness of bacon), turning the pan half way through. When the sugar has melted and the bacon is looking browned and crispy, remove it from the oven. Immediately peel the bacon off of the rack and lay it flat on a sheet of waxed paper to cool a bit. Use the candied bacon as a garnish on salad, alongside your favorite breakfast meal or as the “are you insane?! ?” addition to chocolate fudge. This is a great springtime salad and the addition of candied bacon makes it perfect. Feel free to change the toasted nuts to whichever kind you like most. In a large bowl create a bed of fresh spinach. Top with sliced strawberries and toasted almonds. Pinch off small bits of goat cheese and distribute over salad. Sprinkle crumbled candied bacon over everything and serve with your favorite vinaigrette. This is my standard chocolate fudge recipe. If you have a favorite of your own or prefer milk chocolate, feel free to modify the recipe. 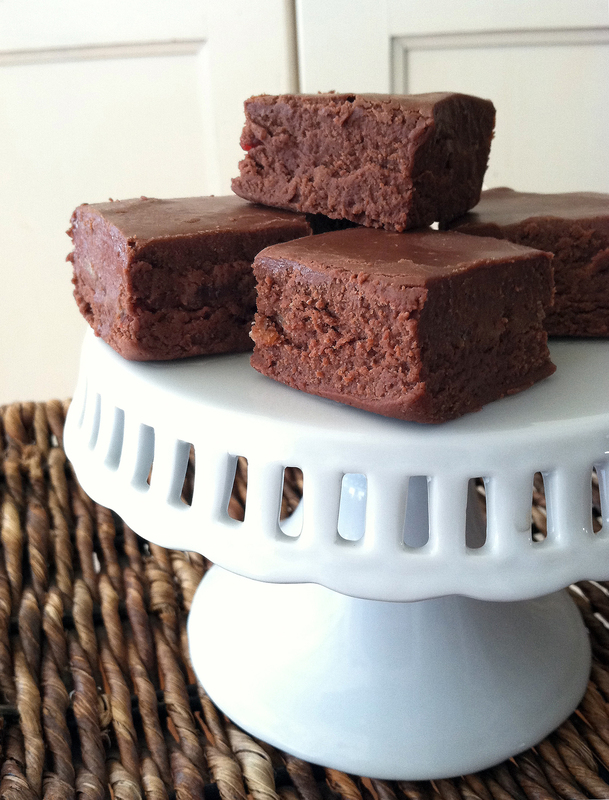 Line a 8×8 brownie pan with parchment paper and set aside. In a medium saucepan combine sugar, evaporated milk and butter. Bring mixture to a boil, then reduce heat and allow to cook for another 5 minutes, stirring constantly. Remove the saucepan from the heat and add the marshmallows, chocolate and vanilla. Stir until the marshmallows and chocolate are melted and the mixture is smooth. Pour the fudge into the prepared pan and chill for several hours, until it’s firm. When the fudge is set lift the parchment out the pan, gently peel it off the block of fudge and cut into squares. Store tightly covered in the refrigerator. I know this seems like a crazy idea but I have yet to have a single person try this say it wasn’t delicious. Rich, extreme and they couldn’t possibly eat more than one piece, but delicious. Place half of the prepared fudge in the bottom of an 8×8 brownie pan lined with parchment paper. Lay the strips of bacon on top of the layer of fudge, making sure to press the bacon down to eliminate air bubbles. Pour the remaining fudge on top of the bacon and chill for several hours, until firm. can’t wait for Easter dinner !!! I’ve had your spinach salad and the crazy delicious fudge and my taste buds are still singing!! The combined flavors of the smokey salty sweet bacon with the berries and cheese is heavenly! The fudge is so super rich and decadent. The surprise in the middle kind of shocks the senses at first! Your tongue is tasting silky chocolate then suddenly, what is that smokey flavor? Can it be, no how could it be? But then the realization it is everyone’s favorite flavor, yes, indisputably “Bacon”! What a wonderful secret filling to discover! You can’t believe this flavor paring tastes so good but it does, but you’ve got to try this one. My mouth is watering just talking about it, Yum! !